Well, its still freezing! I can't stop drinking hot tea and eating warm soup. It just warms me to my core and makes me forget that the temperature is close to 15F outside! We even got a little sprinkle of snow the other day in NC. And yes, just enough to shut down schools, delay the work day and empty the grocery store shelves (Northerners laugh here). As long as the weather continues like this, I will keep sharing soup recipes. This one is from my Fall Cleanse days, remember that?!?! I was able to survive the brutal five days because of this dish though. The soup was from a recommended recipe from the Cleanse list, but I added the Brussels Sprout part for color and texture. I also added some brown rice for a little bit of carbohydrates when I had this during the Cleanse, but it isn't mandatory. I enjoyed the planning part of the Cleanse - making a grocery list, studying recipes and scheduling my days around cooking and preparing as to distract me from my hunger and cravings. I started with a base of recipes and then put my usual spin on things. Since I was doing the Cleanse, I couldn't add any meat or dairy, which I think would be a great addition to this dish. Stir in a little bit of heavy cream at the end or simmer a Parmesan rind in the broth while the carrots cook. Chicken stock could easily be substituted for the vegetable broth as well. Lots of versatility here! In a large thick-bottomed soup pot, saute onions and ginger in the butter over medium heat until translucent. Stir in the carrots and cook for about 5 minutes. Add in the stock and cumin powder and simmer for about 45 minutes until the carrots are soft. While the soup is cooking, line a large baking sheet with parchment. Mix the Brussels sprouts with the oil and some salt and pepper. Roast for 30 minutes in the oven, mixing around once half way through. The goal is to have slightly browned and charred sprouts! Once the carrots are soft, puree the soup by either using an immersion blender (one of my favorite kitchen gadgets) or in a blender (in two batches). To serve, fill a bowl with the carrot soup and top with roasted Brussels sprouts, pepper and parsley. A dollop of creme fraiche or drizzle of heavy cream would be a nice finishing touch as well. Crusty bread or brown rice is a great addition to this dish! My foot is still broken and I still have this stupid cast! But, I have been able to work from home several days over the past month. It is much easier to put my foot up and relax at home than at the office. One of the benefits of working from home, besides working in your jammies is the ability to have a fresh lunch instead of a microwaved meal. The other morning, I had planned to work from home since I couldn't get a ride into work. I woke up extra early with a sudden urge to make muffins....so, I made muffins! I had a particular muffin recipe in mind that required ripe bananas, which it turns out, I had several of in my fruit basket. I love 101 Cookbooks - one of my favorite food blogs and probably the blog that encouraged me to start my own. I was a quick follower of Heidi's and soon purchased her cookbooks. Since it is the weekend, I thought I would share this muffin recipe just in time for Sunday morning breakfast! They are very easy to put together, taste delicious with coffee AND are easily made gluten free. The Hubby didn't even realize I made them gluten free until I told him! Hopefully only two more weeks in the cast, but with this sweet note from my favorite little ones, I am sure to have a speedy recovery! Preheat the oven to 375F and position the racks low in the oven. Line a muffin tin with parchment liners. Combine the flour, baking powder, salt and the espresso powder in a bowl and whisk. In a separate large bowl or a stand mixer, cream the butter until light and fluffy. Beat in the sugar and then the eggs, one at a time. Stir in the vanilla, yogurt, and mashed bananas, then briefly and gently mix in the dry ingredients. Don't overmix! Spoon the batter into the prepared muffin tin with an ice cream scoop. 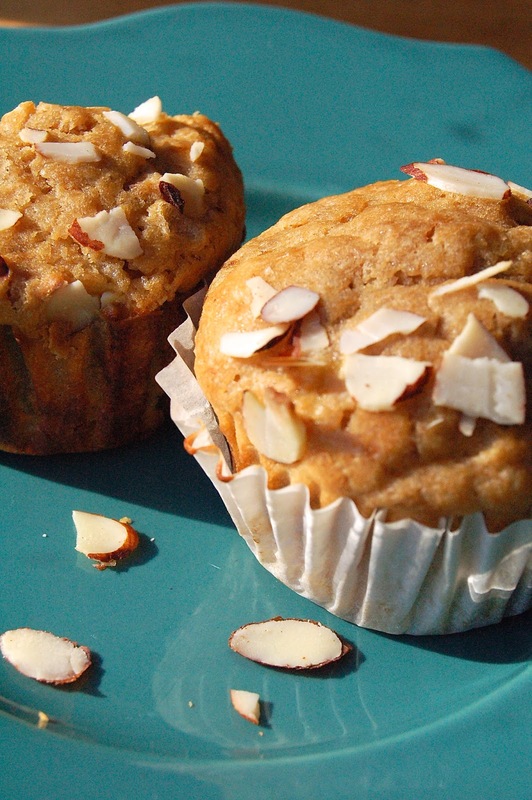 Top each muffin with the slivered almonds and bake until golden, about 25 minutes. Cool the muffins in the pan for 5 minutes, then remove to a wire rack to cool completely. It has been a busy weekend and week so far, so I will keep this short. This past weekend I went to the Panthers game with my bestie and had an awesome opportunity to go down on the field. I will work on getting the video posted for next time! Until then, I have to share one of my favorite soup recipes to keep you warm! Most will agree when I say that the weather has sucked lately. Everywhere! It has been cold, snowy, winter vortex-y It is definitely soup weather, which I am totally OK with! This is another tried and true soup recipe that I bust out when I don't want to think about what to make. I usually have all the ingredients already and can always substitute if needed. The toppings are pretty versatile as well depending on the person. We like to have crispy pancetta, but this soup could easily be made vegetarian. And as usual, this is a very gluten free friendly recipe! In a large soup pot or dutch oven, heat pancetta chunks until rendered and crispy. Remove the pancetta to a paper towel lined plate with a slotted spoon, leaving as much of the fat in the pot as possible (which isn’t too much). Add the celery, onion and carrots into the pot and sauté 7-10 minutes on medium heat. Stir in the curry powder, ground oregano, salt and pepper and continue to sauté for 2-3 more minutes. This soup can be served over steamed rice, chopped fresh spinach or with fresh naan or bread. If you happen to have any mango chutney, stir a tablespoon into the soup for added flavor. I decided to surprise Hubby with a trip to New York City. My cousins, John and Shawn, kindly offered to host us for a foodie-filled weekend. We provided a few requests, then gave them free rein on our itinerary. When most people think of New York, they think of Manhattan, the Empire State Building, Central Park and Times Square...While these are all iconic elements of New York, one of the most best spots, in my opinion, is Brooklyn. My cousins moved there about six years ago and have been raving about it ever since. We finally decided to see what all the hype was about. I had been to New York before as a teenager, but mostly stayed around Manhattan and the other tourist spots. I always wanted to go back since discovering my love for the culinary world and knowing that Hubby had never been. The best part about visiting the city with locals is that you get to experience real New York. Sure, we did a few of the stereotypical tourist stops so Hubby could check it off his bucket list, but we also experienced some of the best meals we have ever had. The Blue Apron - specialty cheese shop in Brooklyn, NY. In the end, it was a jam packed 48 hours, but one of the most incredible food-filled weekends we have experienced in a while. I am lucky enough to have traveled across the States and even the world, but have never experienced such a concentrated Mecca of phenomenal cuisine as New York City.